Introducing the Masters of Evil! Just as the Avengers were Marvel's first team assembled from pre-existing heroes, so too are the M.O.E. Marvel's first team of (mostly) pre-existing villains. And it's a pretty inspired thought! After all, since just about every hero on the Avengers has his own comic - why not take a villain from each and put them all together? Wham - instant crisis! 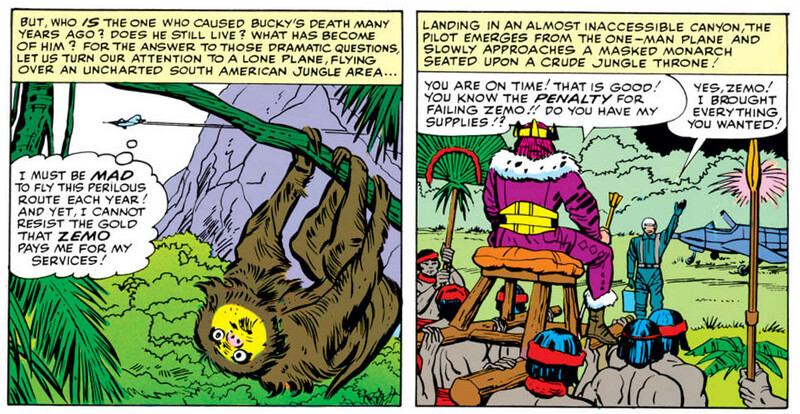 Baron Zemo in the Jungle. Of course, the exception to this formula is their leader, Baron Zemo, since Captain America doesn't have his own mag - not yet anyway - and thus currently has no enemies to call upon. (The obvious choice might have been to bring back the Red Skull, who appeared in Cap's first issue back in 1940, but maybe Stan hadn't yet thought of that - or if he did, realized that the return of Cap's first supervillain should require its own story, when the time was right.) In any case, the solution that Stan hit upon was to create a brand-new villain, but one retrofitted into Captain America's past. In fact, it's made clear that Zemo is the bad guy they were fighting when Cap lost Bucky, right before he went into the deep freeze! And with his hand revealed in that tragic back story, an archenemy is instantly born. Still, if there's one complaint we can voice about this new team of villainy, it's that it does seem thrown together somewhat at random. I mean, the Melter as the foe for Iron Man? Fine. Melting is about as opposite of hard iron as you can get, so he's conceptually a great foil. But the Black Knight fought Giant-Man and the Wasp just the once, and will only be really remembered in later decades, when at all, for his connection to the later Avenger by the same name. And the Radioactive Man - while a fine baddie, I suppose, and certainly emblematic of the nuclear terror of the times - isn't intrinsically a "Thor villain", in the same way that, say, Loki is. Fortunately, later incarnations of the team would be a bit more appropriately matched! Only in the Silver Age, y'all! 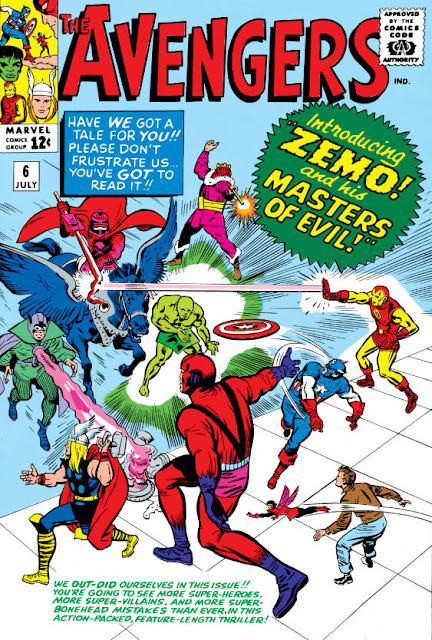 Finally, a note on the new villain, Zemo. We get a bit of his origin, set twenty years earlier in World War II, when he was supposedly so hated a figure that he had to wear a hood everywhere he went. (Although you'd think he might have chosen a color less conspicuous, no?) But a chance conflict with Captain America accidentally smashed a nearby container of Zemo's dastardly new superglue - Adhesive X - and the hood has been stuck on his face ever since. As origin stories go, it's not bad - somewhat reminiscent of Superboy's accidental baldifying of a teenage Lex Luthor, maybe - but c'mon, glue? That was going to be the secret weapon to win the war? I was at that point musing, and thinking how funny it would be if they ever showed a connection between Baron Zemo, and that other gluemeister, Paste-Pot Pete ... and so was caught completely off-guard when I turned the page and saw, to my astonishment, that they DID! As someone the Avengers phone up to help them defeat Zemo's special adhesive, yes, but still: Two villains, one a war criminal and the other a petty thief, yet both of them connected ... by glue. This has to have been the most welcome surprise cameo in all of 1964! Here we have another impressively significant, key issue from the Silver Age - and isn't it amazing how many of those Stan & co. produced, in such an astoundingly short period of time? - with the first appearance of the character who would go on to become Spider-Man's greatest enemy. 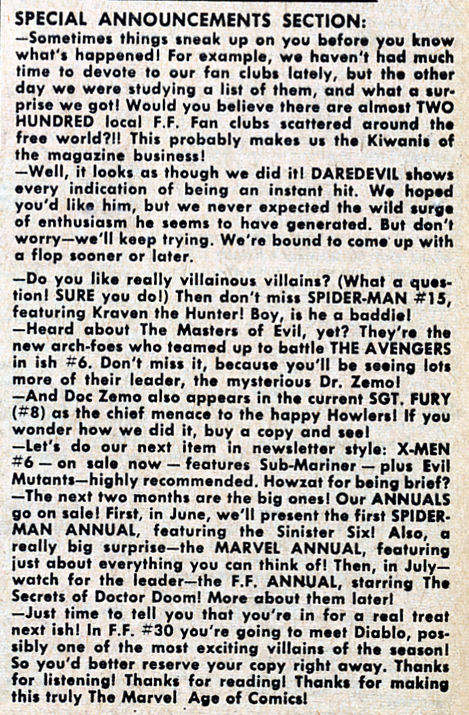 (Granted, the main and lasting reason for that notoriety wouldn't come about until years later, after Stan was no longer writing the title.) This first appearance particularly plays up the "Halloween goblin" aspect of his character; note not only the high-cheeked grin, but also the fact that he rides around not on the Goblin Glider - that would come later - but on a mechanical flying broomstick. In his first appearance, the Goblin looks almost ... cute! And yet the story itself is unmistakably silly. The Goblin wants to take down Spider-Man - so what does he do? What's the most evil and dastardly plan he can think of? Clearly, to approach a movie producer and claim he'll bring him Spider-Man, so the studio can film a story featuring them. WHAT? Spidey takes the pitch - hey, he could certainly use a film star's salary! - and they all fly out to the New Mexico desert. As the camera crew begins to set up, the Green Goblin and the Enforcers tell Spidey they should step away from the cameras to rehearse for a bit ... and that's when they attack in force. Without a doubt, this has to be one of the most convoluted plans for a villain that Stan's come up with yet! Uh ... no. I don't think anyone was expecting that! But as goofy as the setup may be, you certainly can't argue with Lee & Ditko packing as much action as possible into the pages - because we get a guest-appearance by the Hulk as well! (And is it truly just coincidence that both the villain and the guest-star are the same emerald shade? It's certainly never mentioned in the dialogue, as you'd expect.) We're just a couple of months away from the Hulk finally getting his shot at an ongoing feature once again, and Ditko will be Stan's partner there - for a while, at least. Was that plan already in place, and this outing was just to test their work on the creature once again, while reminding the readers that the Hulk was still extant? Or was it actually the other way round - with Ditko & Lee's work this issue providing the impetus to make them realize they could give the monster another go? 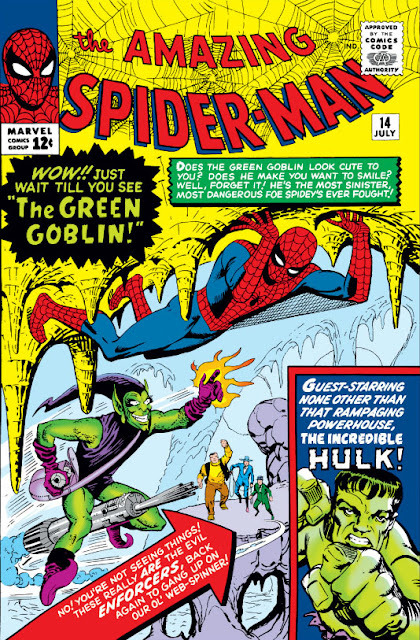 So, all in all, the first appearance of the Green Goblin isn't the most impressive of debuts, and could easily have been forgotten - until the final few panels. Through some clever staging and dialogue, Stan & Steve shine a spotlight on the question of just who the goblin is, and as a result the readers' interest is suddenly piqued. We know now, of course - but as with so many of the successes in this era, they were just making it up as they went along (and the actual reveal would be famously controversial). Still, that smallest of decisions did give the readers a bit of a mystery with which to end the tale, and something for Lee & Ditko to follow up on ... and soon!